Fuel Ox Marine™ is a multifunctional and comprehensive fuel treatment that enhances fuel combustion and engine performance. The Fuel Ox Marine™ contains a patented catalyst that lowers the ignition point of fuel—causing an earlier, more sustained combustion. One gallon of fuel additive is designed to treat 10,000 gallons of distillate fuels. Our customers are really happy with Fuel Ox Marine! They get better fuel economy and their engines run better with less hesitation. We sell a lot of it here! One of my customers had a Mercury Mercruiser 4.3L with a clogged carburetor that was giving him rough idling and poor fuel economy. He was trying products like Startron and Valvtect but the engine performance only improved when he used Fuel Ox. Now he has no problems! 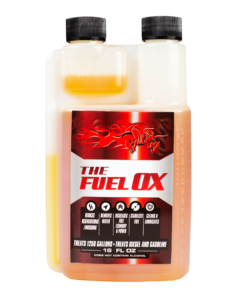 We carry Fuel Ox and our customers love it! As an amateur fisherman, fuel is one of my biggest expenses! I use Fuel Ox in my boat and see a 10% difference in fuel economy! That’s a big number! Along the east coast, Fuel Ox Marine has benefited these fishing charters and has become a staple in their boats’ maintenance. Blue Runner Sportfishing is the leader in luxury sport fishing adventures. This charter service provides outstanding boats, incredible customer service and accommodates your needs to create an experience of a lifetime. Blue Runner Sportfishing comprises of three boats to choose from for your offshore adventure, fishing reports, and online seminars to expand on your fishing knowledge and skills. F/V Cynthia C. 2 is a custom 38′ Holland downeast style. Charter/Commercial groundfish, specifically outfitted to pursue for just about any species of fish that swim in New England waters including striped bass, bluefish and many species of groundfish. Captain Tyler Macallister holds a Masters Captains License issued by the United States Coast Guard, License # 311327. Big Game Sport Fishing is Rhode Island’s Premier Charter Boat Service, offering 4 boats sailing 7 days a week. Go Inshore / Offshore and the Canyons with Rhode Island’s Fishing Charter Professionals. The Big Game Fleet offers a 50′ Post, 36′ Dawson, 36′ Carman and 33′ Hydra Sports center Console. Guiding the New York and New Jersey waters for the past 15 years and specializing in fly-fishing and light tackle, Frank and his team of Captains do it all from back bay for striped bass, blues, and weakfish to offshore fishing in the canyons for tuna, marlin, and sharks. Fishing out of LBI – Beach Haven NJ, The Reel Determined fleet consists of a custom 36 foot Runaway which is powered by twin 350 horsepower Cummins diesels and a 29′ Strike powered by a 450HP Cummins diesel. Want to learn more about how Fuel Ox Marine™ can help your boat? A multifunctional and performance enhancing marine additive. It is designed to remove water from fuel, significantly delay phase separation, and better fuel efficiency. Extremely concentrated formula: a little goes a long way, 1oz of Fuel Ox Marine can treat 80 gallons of fuel. Treats both gas and diesel boats. Contains a demulsifier, which will safely separate the water from the fuel and expel it through recors or separators. I met Rand Taylor, President of Fuel Ox at the 2016 New England Boat Show in Boston, MA. We talked extensively about today’s Ultra Low Sulfur Diesel and the additives available to boost horsepower, reduce soot, increase lubricity and reduce vibration. Fishing for Giant Bluefin Tuna with a harpoon requires a smooth running engine to allow you to get close to the fish. I use a lot of fuel over the course of a fishing season, sometimes Biodiesel (B20), other times off road Ultra Low Sulfur Diesel. I have been using Fuel Ox since the beginning of the fishing season and have just finished my second bottle. The engines in both boats are running great, with very little soot, and a definite increase in performance and efficiency. Unlike other additives, you only need to add a small amount to treat a lot of fuel, so a bottle goes a long way. I am now using it in my tractor as well. I highly recommend it for any diesel application.